Clean environment, Clean minds and corruption free society. To inspire and teach Yoga, Health and Humanity to 10 million children by end of the year 2020! Too much information and too many options making kids confused, weak, adamant, irresponsible and unhealthy these days. This is a big impact on their future and future of humanity. Health: Many children are suffering with this situation. Illnesses like cancer, heart problems, obesity, stress, anxiety, suicidal thoughts etc. due to unhealthy, junk foods, pollution and pesticides. Education: merely academic, which is also theoretical and stressful. Every student think that they are educating to earn money, but they forgot main purpose of education as build their character, knowledge and skill for right livelihood and truthfulness. Most important thing missing in today’s education is Samskara. Mainly learning about their duty, about their mind and how to make brain excellent & healthy, learn about body to make fit, learn about food to eat healthy, learn about soil to grow food. Learn how to use their maths, science in their day to day life. Mainly every kid must care their health, their parents, country and planet. Learn to live with happiness by happiness and working with responsibility. Well! there is no short cut. We all must be an example. but where are these examples? We must inspire ourselves and start living proper life and spread inspiration to next generation. We must adopt and practice well proven systems from our ancient system. Wake up early & follow ideal daily schedule. Grow as many trees as possible in your home and around.. encourage more to do so. Some medicinal trees like neem, some fruit trees like Mango, Gova, Papaya etc. east fresh organic fruits from your garden.. be healthy. To make Samskar Yoga happen, it may not be overnight change, but must start spreading inspiration. To communicate this message in big scale, we initiated Yogathon challenge for kids every year. this is helping kids to get inspired to practice Yoga & meditation. Yogathon teaches Suryanaskaras, Yogasanas, Nature and Health practically. When everyone involved in the challenge they will understand their own strength, then they start their inward journey to understand their mind and body. It gives them seriousness to practice Yoga and meditation. United Nations, Government and all authorities already made decisions to make Yoga as part of education in all schools. Though everyone is talking about Yoga in schools, very few schools could do it due to shortage of proper teachers. Take Leadership and commitment from real Yoga practitioners /teachers. Be an Example: All teachers in the school must also learn and practice Yoga regularly in their day to day life and prove that how it is helping for their health can efficiency of mind. Children will take it more seriously when you give more importance to this. Inspire every day: Children get inspired and show more interest by seeing teacher as an example. Inspiration is key ingredient of our teaching. As we conduct pre-events of Yogathon in different levels from school level to state-level, children learn surynamaskar within one event and remember sequence well to continue practice. This is helping to continue practice. After 108 suryanamaskaras, teaching them about yogasanas, about real meaning of Yoga, Humanity and Health, which has made huge difference.. Over 1.2 lacs children were able to learn with our previous Yogathon events and Yoga workshops from 3000 institutions. Follow-up: Of course regular follow-up in school is required.. so we requested many schools to do daily 10 minutes group meditation during their assembly time or first hour of each class. Atleast weekly 2 days Yoga practice sessions. 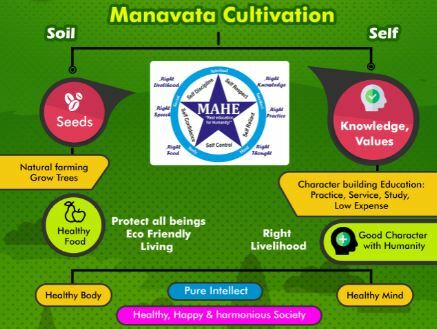 Manavata has implemented regular program in 5 government schools, which helped many kids to become more active, healthy and able to focus in their day to day classes. Over 1000 students got benefitted in this. I really feel we are losing time by working in silos. Many people and organisations would like to do similar.. some of them working in silos making little impact here and there.. some of them couldn’t do anything.. but everyone is facing challenges to inspire children consistently and making the positive change. If we work together we can make a bigger impact.